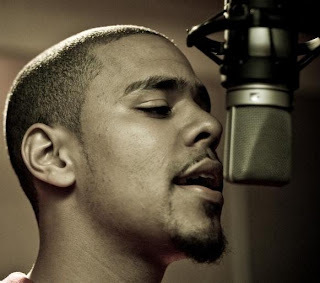 North Carolina native J. Cole (born Jermaine Cole) is a refreshing artist in route for fame and "stardom". J Cole is the first artist signed to Jay-Z’s Roc Nation record label, Cole made himself noticable through a driven approach towards the rap game after graduating from St. John’s University. If the signing by Jay Z shocked his fan base, their doubts were quickly refuted when J. Cole dropped his recent mixtape The Warm Up, and coveted guest verse on JAY-Z’s Blueprint 3 w/ “A Star is Born”. Strong and lyrical, J. Cole’s rhymes touched everything from his childhood in North Carolina to the poverty that affected the North Carollina community. The mixtape displays all that he is as a rapper along with who he is as an artist and a person. J Cole was determined to take the essense of storytelling and incorporate it into his music. J. Cole took on writing his own lyrics at the age of 15, tons notebooks filled with rhymes and observations was at his grasp soon after but with no DJ or producer to help him with beats, he taught himself using a beat machine given to him by his mother. From that point on J. Cole was constantly creating new music and even hotter lyrics providing him with his now, well rounded above average talent.